One of Friends of Acadia’s goals for this centennial year has been to “inspire Acadia’s future.” A historic gift from the Diana Davis Spencer Foundation to the Tomorrow’s Stewards pillar of FOA’s Second Century Campaign will do just that: the $2 million grant is the largest ever in FOA’s history to be dedicated toward youth engagement programs at Acadia. “At a time when our children are inundated with technology and media, I believe exposing them to a national park like Acadia will awaken a sense of awe for the beauties of nature and have a profound effect on their attitudes and memories,” says Diana Davis Spencer. “And, youth is Acadia’s future!” Diana has been spending summers in Northeast Harbor most of her life and inherited a passion for all things Acadia from her mother, Kathryn Wasserman Davis. Diana and her daughter Abby Moffat are also continuing Kathryn’s strong tradition of philanthropy and community involvement through the foundation’s support for efforts such as the Second Century Campaign. The $2 million grant establishes the Diana Davis Spencer Foundation Endowment for Youth Programs in Acadia, which will allow Friends of Acadia to work with Acadia National Park, area schools, and partner organizations to expand opportunities for young people to learn, work, and serve in the park through academic programs as well as summer jobs. Already, the gift has helped hundreds of Maine fourth-graders to make field trips to Acadia this fall, and has funded several internship opportunities for teens interested in working in the park. A portion of the grant will create a permanent endowment to ensure FOA’s ability to continue these vital opportunities well into the future. Since Friends of Acadia publicly announced the Second Century Campaign at our annual meeting on July 8th—the actual hundredth birthday of Acadia—we have been overwhelmed by the spirit of generosity and commitment that so many have shown toward this historic initiative. Whether it was the stirring testimonials shared by our campaign co-chairs on July 8th; or the excitement around the 2016 Acadia Centennial; or concern around pressures facing the park due to rapidly-rising visitation—the interest in this campaign has been tremendous. Hundreds of gifts of all sizes from near and far have brought us within striking distance of our $25 million goal—but we still have more than $1 million to raise between now and year-end. We are very grateful for a $1 million challenge grant issued by the Martha and Alexis Stewart Foundation that has played a huge role in our progress and momentum in recent weeks. As Martha Stewart commented: “Acadia National Park is very special to me and my family and we are happy to support Friends of Acadia in this centennial year. With this special challenge grant, we hope to encourage and inspire others to ‘give back’ to Acadia— a truly magical place.” The family has chosen to direct its support toward the Wild Acadia initiatives as part of the campaign— ensuring healthy woods, waters, flora, and fauna at Acadia in the face of rapid environmental change and pressures on park habitats. All campaign gifts, from the start of the challenge in early fall until we reach the $1 million goal, will automatically be matched dollar for dollar. The Second Century Campaign is already playing a meaningful role in Acadia’s resource protection, youth engagement, visitor experience, and trails and carriage road work—and this impact will only grow over time as permanent endowments ensure a sustained emphasis on these priority areas at our park. Please join us as we stretch to meet our ambitious campaign goals by year-end! Join the Celebration! Support the campaign by making a gift today. 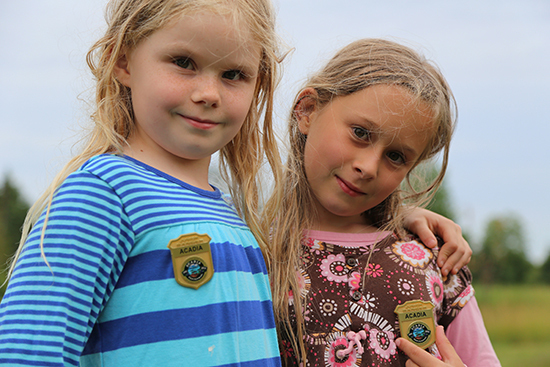 Photo: Today’s young people, like these proud Centennial Junior Rangers, are vital to Acadia’s future. Now FOA can do more to excite their curiosity and strengthen their connections to this remarkable place. FOA/Aimee Beal Church photo.